f13.net | f13.net General Forums | The Gaming Graveyard | City of Heroes / City of Villains | Topic: City of Heroes - Going Rogue 0 Members and 1 Guest are viewing this topic. Paragon Studios™ is proud to officially announce the next City of Heroes® expansion, City of Heroes Going Rogue™! This will be the first major expansion for the City of Heroes franchise since the launch of City of Villains® in 2005. Praetoria, a utopian mirror to our own world, hides a dark secret. Exploring this mysterious alternate earth, the heroes and villains of this world feel an uneasiness of doubt creep over them. Loyalties are questioned. Choices are made. Lines are drawn. As they search for the truth behind Emperor Cole and his Praetorian guard, brutal foes and fierce allies emerge, turning this once blissful paradise into a battle ground. 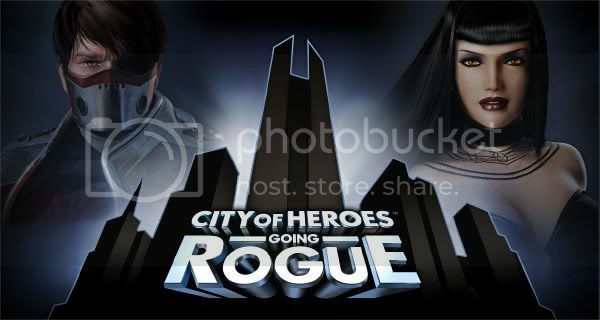 For more information, read the official press release and check out our new Going Rogue website to view the announcement trailer and register for the latest news and updates for City of Heroes Going Rogue. As I said, no official word just yet. This could either be an amazingly elaborate scam (all the links go to a site called 'newzyouwant.com' - I fully appreciate I may be being overcautious but since my flatmate just had his debit card details stolen and used online I've gotten pretty fascistically security conscious) or a news leak that'll have someone's head on a silver platter tomorrow morning, but considering this is pretty much one of the top features on many players 'most wanted' lists and was heavily hinted at in the mysterious email surveys of last year, it's going to be interesting to see how this pans out. *I saved the email header image just in case linking it from its parent site was a bad idea. newzyouwant.com is legit (check your older CoH newsletters and you'll see they come from the same place) but the links in that newsletter going to cityofheroes.com and ncsoft.com are messed up (at least in my copy of the newsletter) so there's no official confirmation yet. Good to see the team who stayed with the title putting up a fight. The possibility of them deflating champions online is delightful. Though while the underlying mechanics of CoH are still sound the playerbase is jaded, much of the game is dated and there's a lot of super hero MMO's in the pipeline. It's going to be a tough competition for them. Weird, I didn't get that email. Still nice to see. It's about time they did Hero/Villain crossovers. Ever since all accounts opened up to both sides I've been vaguely considering resubbing and playing a hero for the sole reason of not having to deal with masterminds. Ironic then that this is what might get me to actually resub, depending on what other features they add. That was a long way of saying "We've got nothing for you yet". Not surprising since the Press Release still isn't out yet. Going Rogue will also introduce two primary new fictional characters representative of this alignment shift in the game's lore: Maelstrom, a pistol-wielding hero gone rogue, and Desdemona, a demon-summoning villain who has been redeemed. Of course it's full of pre-order and trial account buttons, but there's also a button for Featured Content. I tried clicking on the video, but got a "stream not found" message, so it looks like they haven't quite finished kicking the tires on the site yet. When it is up, it will supposedly show a video of the Dual Pistols powerset in action. Disclaimer: this is just a new web site, Going Rogue is still scheduled for July, iirc. Dual pistols are up on live now for those who prepurchase the expansion. Level 1 corruptors are everywhere. e: I'm going to be one of them shortly, so if you have any questions, you know. Did they ever boost the single target damage output? I tried the closed beta for a bit and it felt very weak.